Sleek, contoured and fully adjustable protective eyewear, 3M™ BX™ features a soft adjustable nose bridge, lens angle adjustment, and adjustable length temples for extended wear. 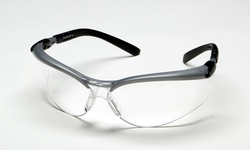 BX protective eyewear is built to help offer adjustable comfort. The polycarbonate lens has three lens angles for a cozy fit. Integrated sideshields and soft nose bridge combine to offer pleasant extended wear. These sleek, contoured and adjustable BX safety glasses help protect your eyes from impact and UV.